It’s the middle of summer. The heat is on, and while you’re sporting a nice tan, your plants have suddenly taken on a pale, pasty look. What gives? 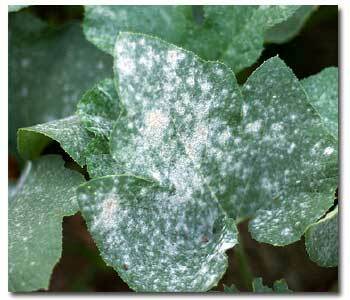 Say hello to the fungus disease known as powdery mildew. A common condition found on plant life throughout North America, powdery mildew is characterized by spots or patches of white to grayish, talcum-powder-like growth. Fortunately, it is usually more of an effect than a problem itself. In other words, in addition to treating the plant, you’ll probably want to take a look at the surrounding conditions and make some adjustments. First and foremost is to make sure you give plants plenty of room. Good air circulation goes a long way. Trim plants that have gotten crowded or bushy. Avoid overhead watering, and don’t make late summer applications of nitrogen fertilizer, as powdery mildew loves to attack the newest plant growth which, of course, nitrogen encourages. To halt the fungus in its tracks, spray with a good fungicide. And next time around, try to choose the more mildew-resistant cultivars of plants that are most susceptible to powdery mildew, like zinnias, bee balm, crape myrtles, cucumbers and squash.